Custom sizes are available. Please call for pricing and delivery. Swatch sample available upon request. Free shipping within contiguous 48 United States on orders over $500. Composed of a 14.5 oz. Polyester blend that is silicone treated, this is an extraordinary fabric for outdoor uses. 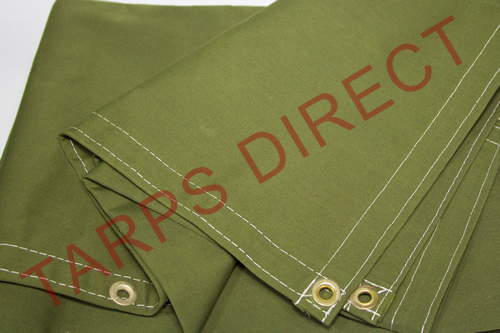 Polyester canvas has double the strength of traditional cotton canvas tarps. Because of the DRY finishing process, strong chemical odors and the wax-like feel are eliminated. WorkHorse Tarps do not bleed so it will not have the possibility of staining the item it is covering! Polyester canvas is WATERPROOF yet breathable to eliminate condensation as compared to cotton canvas which is only water resistant. With brass spur grommets approximately every 24 inches apart and all seams lock-stitched, this product is a true "WorkHorse" of tarp materials. 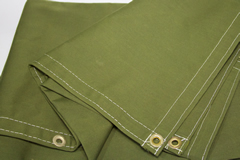 Due to the nature of seams, the tarp will be water-resistant where seamed and possibly allow slight moisture through. An added advantage is the low shrinkage rate of 0-1% as compared to up to 8% for a traditional cotton canvas tarp. Please note WorkHorse polyester tarps are listed as a cut size - finish size is 6" or 3%-5% smaller. Tarps Direct's 14.5 ounce "WorkHorse" tarps are manufactured in the USA of a strong polyester blend that is silicone treated. WorkHorse is waterproof, breathable and will not bleed or stain. Lock-stitched seams and hem provide extra strength and durability. Brass spur grommets on the corners and approximately every 24" apart on all sides provide excellent tie-down opportunities. WorkHorse tarps work well for equipment covers, duck blinds, canopies, truck (steel hauler covers) covers, outdoor furniture covers, boat covers, material covers and many more. Custom sizes are available upon request. Please call for pricing and delivery.